The 'Complete Streets' concept and movement in urban planning and policy has been hailed by many as a revolution that aims to challenge the auto-normative paradigm by reversing the broader effects of an urban form shaped by the logic of keeping automobiles moving. By enabling safe access for all users, Complete Streets promise to make cities more walkable and livable and at the same time more sustainable. This book problematizes the Complete Streets concept by suggesting that streets should not be thought of as merely physical spaces, but as symbolic and social spaces. When important social and symbolic narratives are missing from the discourse and practice of Complete Streets, what actually results are incomplete streets. The volume questions whether the ways in which complete streets narratives, policies, plans and efforts are envisioned and implemented might be systematically reproducing many of the urban spatial and social inequalities and injustices that have characterized cities for the last century or more. 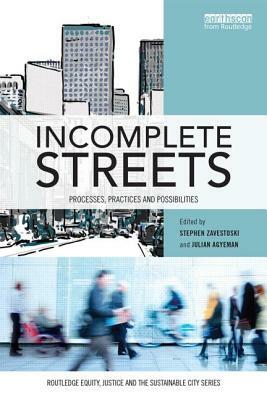 From critiques of a "mobility bias" rooted in the neoliberal foundations of the Complete Streets concept, to concerns about resulting environmental gentrification, the chapters in Incomplete Streets variously call for planning processes that give voice to the historically marginalized and, more broadly, that approach streets as dynamic, fluid and public social places. This interdisciplinary book is aimed at students, researchers and professionals in the fields of urban geography, environmental studies, urban planning and policy, transportation planning, and urban sociology. Stephen Zavestoski is Sustainability Director at the College of Arts and Sciences and Co-Chair of the Environmental Studies Program at the University of San Francisco, USA. Julian Agyeman is a Professor in the Department of Urban and Environmental Policy and Planning, Tufts University, USA. He is Founding Editor of Local Environment: The International Journal of Justice and Sustainability, published by Taylor and Francis.